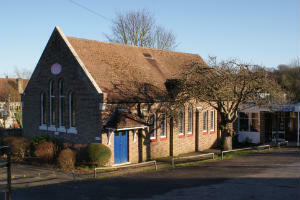 Woodmansterne Baptist Church is situated in Pine Walk, Woodmansterne, Surrey SM7 3QA. We can be found behind the shops at the bottom of Rectory Lane (B278) in the village of Woodmansterne. We are approximately two miles from both Banstead and Coulsdon. Do come and find us! We have a car park on two levels, with allocated disabled parking spaces on the lower level. You can also reach us via public transport. We are just a short walk from the Outwood Lane bus stop serviced regularly by the 166 bus (operated by Arriva London South between West Croydon and Epsom) outside The Midday Sun public house. London to Tattenham Corner line) about two thirds of a mile away.